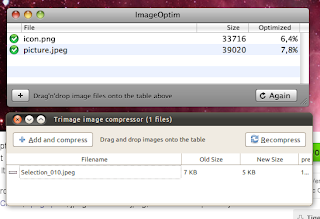 Trimage Image Compressor Optimizes Your Photos - OMG! Ubuntu! 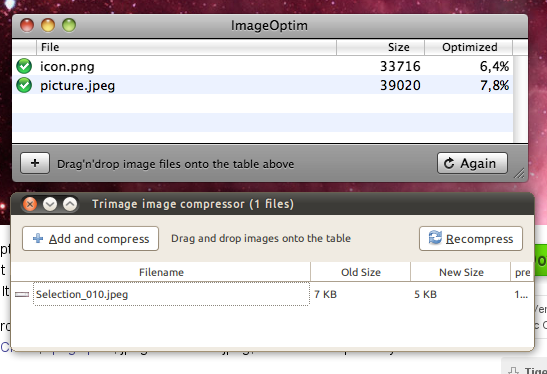 Trimage image compressor will losslessly optimise PNG and JPG files in a snap. Available with both GUI and command-line interfaces, the application optimizes images via optipng, advpng and jpegoptim, depending on the filetype. The interface was inspired by OS X application ‘imageoptim’. This way you will remain up-to-date with future fixes and features, automatically have dependencies installed & won’t have to fiddle around compiling. If the latter reasons excite you then Trimage is, of course, available to compile from source.